Annie McBride, newly widowed, is trying to find her way without her husband. Venturing out to visit the cemetery, she finds a small child sitting on the bench near his grave, naked and alone. She takes the child home with her but the child doesn’t speak for days although she warms to Annie’s kindness. Annie, a witch who gave up practicing when she married her husband, goes to a fellow witch to ask for help. Answers are not as forthcoming as Annie would like so she packs up the little girl, now named Margaret, and the two leave town. Maggie McBride, now an adult caring for her aging mother Annie, finds out she adopted. After her mother’s death, she decides to return to her mother’s hometown of Salem, Massachusetts to open a holistic store in the old house left to her and possibly learn more about her mother in the process. Giving up her job as a police profiler, she finds roots she never knew she had which includes a talent for witchcraft. Tapping into the past through a spinning wheel inherited from her mother, Maggie finds herself drawn to the story she is witnessing and in particular a woman named Abigail March whose life she is seeing in the visions brought on by touching the spinning wheel. Her forays into the past come a halt when the neighbor’s daughter goes missing and her skills as a police profiler are needed. Maggie suddenly finds past and present combining in a way she never imagined possible. This is a self-published book which I tend not to review but considering this year I’ve read several, I seemed to have broken my own rule. One of the reasons I tend not to read self-published is because I feel the books need a tad more editing. This one felt fairly comfortable and I didn’t have problems with it. I thought the time travel aspect was good and I particularly enjoyed those bits where we see Abigail’s life and her witchcraft abilities growing through her children. Those parts of the story felt genuine and I was easily entertained with this story line, in fact, I wished there had been more of it. Maggie, I felt was a tad hard to get attached to but there’s a reason for this and not wanting to give too much away in terms of plot, I won’t mention it but it became clear as the story went on. I wasn’t sure what to think of this book going in but I wanted to keep an open mind. I wasn’t completely impressed or completely underwhelmed either. Somewhere in the middle on this one I guess. The witchcraft element was well-done and the historical time travel/visions were good. I just wish there had been fewer intrusions from the present on that story line though. 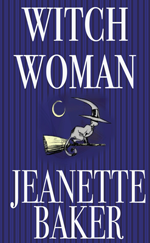 More information about Witch Woman can be found on Jeanette Baker’s website.